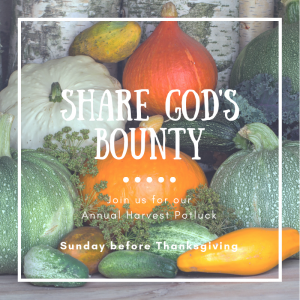 Please bring a dish and join us for our annual potluck dinner after the service this Sunday, Nov. 18! Set-up will be Saturday at 10 a.m. if you can help organize our new parish hall for the event. And of course, we’ll need a clean-up crew after the dinner. And even if you forget to bring something, there is always plenty of food, so please come!